There is a significant amount of empirical evidence suggesting that, for a given individual and under normal circumstances, the optimal weight is the one that maximizes the ratio below, where: L = lean body mass, and T = total mass. L is difficult and often costly to measure. T can be measured easily, as one’s total weight. Through some simple algebraic manipulations, you can see below that the ratio above can be rewritten in terms of one’s body fat mass (F). Therefore, in order to maximize L / T, one should maximize 1 – F / T. This essentially means that one should minimize the second term, or the ratio below, which is one’s body fat mass (F) divided by one’s weight (T). So, you may say, all I have to do is to minimize my body fat percentage. The problem with this is that body fat percentage is very difficult to measure with precision, and, perhaps more importantly, body fat percentage is associated with lean body mass (and also weight) in a nonlinear way. In English, it becomes increasingly difficult to retain lean body mass as one's body fat percentage goes down. 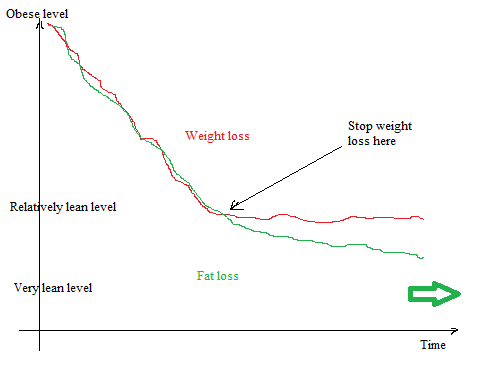 Mathematically, body fat percentage (F / T) is a nonlinear function of T, where this function has the shape of a J curve. This is what complicates matters, making the issue somewhat counterintuitive. Six-pack abs may look good, but many people would have to sacrifice too much lean body mass for their own good to get there. Genetics definitely plays a role here, as well as other factors such as age. Keep in mind that this (i.e., F / T) is a ratio, not an absolute measure. Given this, and to facilitate measurement, we can replace F with a variable that is highly correlated with it, and that captures one or more important dimensions particularly well. This new variable would be a proxy for F. One the most widely used proxies in this type of context is waist circumference. We’ll refer to it as W.
W may well be a very good proxy, because it is a measure that is particularly sensitive to visceral body fat mass, an important dimension of body fat mass. W likely captures variations in visceral body fat mass at the levels where this type of body fat accumulation seems to cause health problems. Therefore, the ratio that most of us would probably want to minimize is the following, where W is one’s waist circumference, and T is one’s weight. Based on the experience of HCE () users, variations in this ratio are likely to be small and require 4-decimals or more to be captured. If you want to avoid having so many decimals, you can multiply the ratio by 1000. This will have no effect on the use of the ratio to find your optimal weight; it is analogous to multiplying a ratio by 100 to express it as a percentage. Also based on the experience of HCE users, there are fluctuations that make the ratio look like it is changing direction when it is not actually doing that. Many of these fluctuations may be due to measurement error. If you are obese, as you lose weight through dieting, the waist / weight ratio should go down, because you will be losing more body fat mass than lean body mass, in proportion to your total body mass. It would arguably be wise to stop losing weight when the waist / weight ratio starts going up, because at that point you will be losing more lean body mass than body fat mass, in proportion to your total body mass. One’s lowest waist / weight ratio at a given point in time should vary depending on a number of factors, including: diet, exercise, general lifestyle, and age. This lowest ratio will also be dependent on one’s height and genetic makeup. Mathematically, this lowest ratio is the ratio at which d(W / T) / dT = 0 and d(d(W / T) / dT) / dT > 0. That is, the first derivative of W / T with respect to T equals zero, and the second derivative is greater than zero. The lowest waist / weight ratio is unique to each individual, and can go up and down over time (e.g., resistance exercise will push it down). Here I am talking about one's lowest waist / weight ratio at a given point in time, not one's waist / weight ratio at a given point in time. This optimal waist / weight ratio theory is one of the most compatible with evidence regarding the lowest mortality body mass index (, ). Nevertheless, it is another ratio that gets a lot of attention in the health-related literature. I am talking about the waist / hip ratio (). In this literature, waist circumference is often used alone, not as part of a ratio. One of the most fascinating topics for an independent health researcher is the dichotomy between short- and long-term responses in successful dieters. In the short term, dieters that manage to lose a significant amount of fat mass, tend to feel quite well. Many report that their energy levels go through the roof. A significant loss of fat mass could be considered one of 30 lbs, or 13.6 kg. This is the threshold for weight loss used in the National Weight Control Registry. Ideally you want to lose body fat, not lean mass, both of which contribute to weight loss. So, in the short term, significant body fat loss feels pretty good for the dieters. In the long term, however, successful dieters tend to experience the symptoms of chronic stress. This should be no surprise because some of the same hormones that induce a sense of elation and high energy are the ones associated with chronic stress. These are generally referred to as “stress hormones”, of which the most prominent seem to be cortisol, epinephrine (adrenaline), and norepinephrine (noradrenaline). Stress hormones display acute elevations during intense exercise as well (). This is all consistent with evolution, and with the idea that our hominid ancestors would not go hungry for too long, at least not on a regular basis. High energy levels, combined with hunger, would make them succeed at hunting-gathering activities, leading to a period of feast before a certain threshold of sustained caloric restriction (with or without full fasting) would be reached. This would translate into a regular and cyclical hunger-feast process, with certain caloric costs having to be met for successful hunting-gathering. After a certain period of time under sustained caloric restriction, it would probably be adaptive among our ancestors to experience significant mental and physical discomfort. That would compel our hominid ancestors to more urgently engaged in hunting-gathering activities. And here is a big difference between those ancestors and modern urbanites: our ancestors would actually be working towards getting food for a feast, not restraining themselves from eating what they have easily available at home or from a grocery store nearby. There are major psychological differences here. Dieting, in the sense of not eating when food is easily available, is as unnatural as obesity, if not more. So what are some of the mechanisms by which the body dials up stress, leading to the resulting mental and physical discomfort? Here is one that seems to play a key role: hypoglycemia. Of the different types of hypoglycemia, there is one that is quite interesting in this type of context, because it refers to hypoglycemia in response to intake of any food item that raises insulin levels; that is, food that contains protein and/or carbohydrates. More specifically, we are referring here to reactive hypoglycemia, of the same general type as that experienced by those on their way to type II diabetes. But reactive hypoglycemia in successful dieters is often different from that of prediabetics, as it is caused by something that would sound surprising to many: successful dieters appear to become too insulin sensitive for their own good! There is ongoing debate as to what is considered a blood glucose level that is low enough to characterize hypoglycemia. Several factors influence that, including measurement method and age. One important factor related to measurement method is this: commercial fingerstick glucose meters tend to grossly underestimate low glucose levels (e.g., 50 mg/dl shows as 30 mg/dl). Having said that, glucose levels below 60 mg/dl are generally considered low. Luyckx and Lefebvre selected 47 cases of reactive hypoglycemia for a study, from a total of 663 standard four-hour oral glucose tolerance tests (OGTT). They classified these 47 cases as follows, with the number of cases in each class within parentheses: obesity (11), obesity with chemical diabetes (9), postgastrectomy syndrome (3), chemical diabetes without obesity (1), renal glycosuria (7), and isolated reactive hypoglycemia (16). Postgastrectomy is the period following a gastrectomy, which is removal of part of one’s stomach. The modern term for this stomach amputation procedure is “bariatric surgery”; admittedly a broader term, which many people say they would do as if they were referring to a walk in the park! In the cases of isolated reactive hypoglycemia, the individuals had normal weight, normal glucose tolerance, and no glycosuria (excretion of glucose in the urine). 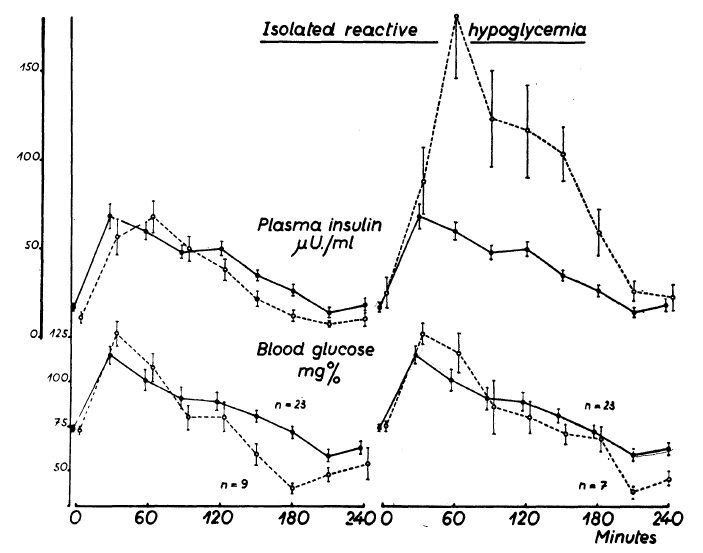 As you can see in the paragraph above, this, isolated reactive hypoglycemia, was the category with the largest number of individuals. The figure below illustrates what happened in these cases. The cases in question are represented in the left part of the graph with dashed lines (the full lines are for normal controls). There a reasonably normal insulin response, lower in fact in terms of area under the curve (AUC) than for the controls, leads to an abnormal reduction in blood glucose levels. They are 9 out of 16, the majority of the isolated reactive hypoglycemia cases. In those 9 individuals, insulin became “more potent”, so to speak. 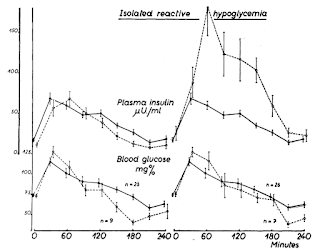 Reactive hypoglycemia is frequently associated with obesity, in which case it is also associated with hyperinsulinemia, and caused by an exaggerated insulin response. About 40 percent of the reactive hypoglycemia cases in the study were classified as happening in obese individuals. This study suggests that, if you are not obese, and you are diagnosed with reactive hypoglycemia following an OGTT, chances are that the diagnosis is due to high insulin sensitivity – as opposed to low insulin sensitivity, coupled with hyperinsulinemia. A follow-up test should focus on insulin levels, to see if they are elevated; i.e., to try to detect hyperinsulinemia. Quite a few are folks who do things like ditching industrial foods, regularly eating organ meats, and doing resistance exercise. How can you go wrong doing all of these, generally healthy, things? Well, they all increase your insulin sensitivity. If you don’t build in plateaus to slow down your progress, you may not give your body enough time to adapt. You may become too lean, too fast, for your own good. The more successful the diet, the bigger is the risk. No wonder the paleo diet is being targeted lately as a “bad” diet. How can you go wrong on a diet of whole foods; “real” whole foods, not “whole wheat”? Well, here is how you can go wrong. The diet, if not managed properly, may be too successful for your own good; too much of a good thing can be a problem, you know! See the graph below, from a previous post on a related topic (). I intend to discuss a method to identify the point at which weight loss should stop, in a future post. This method builds on the calculation of a simple index, which is unique to each individual. Let me just say now that I suspect that, with exceptions, frequently people are hurting their health by trying to have six pack abs. But what does all this have to do with stress hormones? The connection is this. Hypoglycemia is only “felt”, as something unpleasant, due to the body’s frequent acute stress hormone response to it. Elevated levels of stress hormones also increase blood glucose levels, countering hypoglycemia. Our body’s priority is preventing hypoglycemia, not hyperglycemia (). And here is an interesting pattern, based on anecdotal evidence from HCE () users. It seems that folks who have abnormally high insulin sensitivity, also have medium-to-high HbA1c (a measure of glycation) and fasting blood glucose levels. By medium-to-high HbA1c levels I mean 5.7 to even as high as 6.2. Since cortisol is elevated, one would expect higher fasting blood glucose levels – the “dawn phenomenon”. But higher HbA1c, how? I am not sure, but I believe that HbA1c will be found in the future to be something a bit more complicated than what it is believed to be: a measure of average blood glucose over a period of time. I am not talking here about cases of anemia. One indication of this complicated nature of the HbA1c is the fact that blood glucose levels in birds are high yet HbA1c levels are low, and birds live much longer than mammals of comparable size (). Some birds have extremely high glucose levels, even carnivorous birds who consume no or very small amounts of carbohydrate (e.g. hawks), with fairly low HbA1c levels. The title of this post is inspired in the classic short novel “Strange Case of Dr. Jekyll and Mr. Hyde” by the Scottish author Robert Louis Stevenson; who also authored another famous novel, “Treasure Island”. In “Dr. 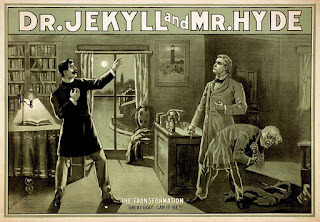 Jekyll and Mr. Hyde”, gentle Dr. Jekyll becomes nasty Mr. Hyde (see poster below, from Wikipedia). Mr. Hyde had a bad temper, impaired judgment, and was prone to criminal behavior. Hypoglycemia has long been associated with bad temper, impaired judgment, and criminal behavior (, ).